Oh, how sweet is the carelessness of a summer break in the countryside when you’re young, wild and beautiful. Such is life at first for the main characters of Mustang—Deniz Gamze Ergüven’s first film—but that would all soon change. The five sisters run around in the sun, their long hair flowing in the wind, toward the sea. Some boys carry them on their shoulders as they play fight in the water. When the girls get home, the whole village has heard of their proximity with boys. Their grandmother tells them they have dishonoured the family and will be locked up. With the sisters being married off, this is the last time all five of them will be together. The film is set in Turkey, but it feels instantly familiar in that it has a fable-like tone, far from the naturalism one could expect. The sisters are orphans, subject to a controlling uncle who decides it is time to marry them off. These girls are more than inseparable—they are so united that they are almost the same. When one is attacked, all of them are. And yet, they will have to be torn apart from each other. While the film shifts between adventure and tragedy, the story feels particularly delicate, like a flower that slowly loses its five petals. What may catch your interest is that the director brought European sensibilities to a setting presented here as a conservative patriarchal community. That blending of cultures seems to speak not only of Ergüven’s own status as a French-Turkish citizen, but also of the complexities of a country that is simultaneously part of two continents. The girls are so free and uninhibited, it is a shock to find them suddenly imprisoned and bereft of any free will. Perhaps that is commentary on a country that granted women the right to vote before France—and Quebec—did, but whose recent leaders have expressed alarming opinions on women’s rights, some of which are heard on a T.V. broadcast during the film. 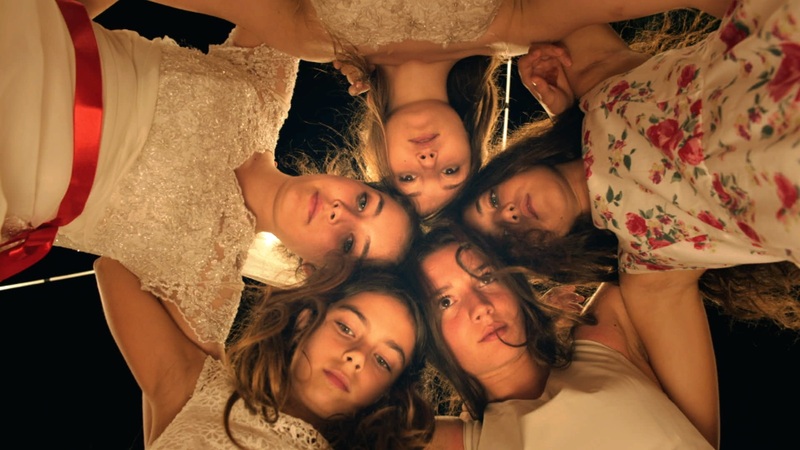 Based partly on the director’s personal experiences in her home country and partly on her observations, Mustang remains very classical in its storytelling, relying on touchingly soft imagery, a compelling score by Warren Ellis and most of all the performances of the five young actors who dominate the cast. While they don’t look alike enough to be perfectly believable as sisters, they have genuine chemistry with each other and a comfortable screen presence. Never shy of the camera or their cast members, they seem to celebrate femininity with every move and every gaze. Narrated with a certain sadness by the youngest sister, Lale (Günes Sensoy), who dreams of Istanbul and a different fate for her siblings and herself, the film can be taken as a half-rebellion and a half-surrender, in which captive characters can challenge a man, but will ultimately have to adjust themselves into a system they cannot change. Mustang could have benefited from a less straightforward narrative and looked closer into plot points that are only hinted at, but it’s an undeniably effective drama that is also, for all its difficult passages, a pleasure to watch.